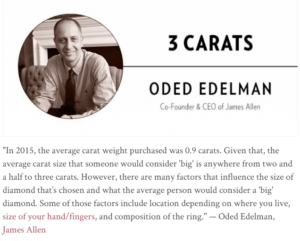 Three is the magic number when it comes to carat weight. It reaps compliments, making the wearer feel special. As a regal stunner, 3 carats can turn ordinary women into wide-eyed aficionados. It’s the rock worn by the rich and famous, and the size dreamt of by the average girl! Now, if you’re thinking of purchasing a 3 carat diamond engagement ring, you're up for a challenge! But do not panic. 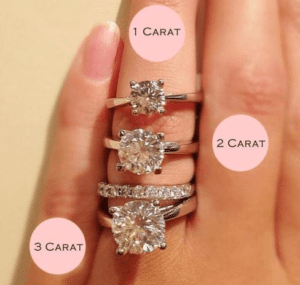 I am here to give you a smooth rundown on 3 carat diamond rings! After reading the tips below, you’ll be on your way to finding the perfect engagement ring. 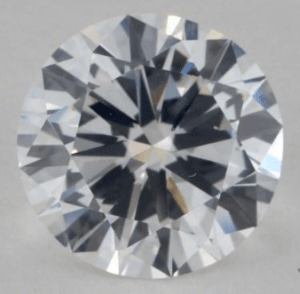 3 Carats – The Carat Weight for a Head Turner! It may look small when compared to A-listers’ gems, but 3 carats is hailed as huge by average women. Although, for practical reasons, not everyone would want to wear it every day. 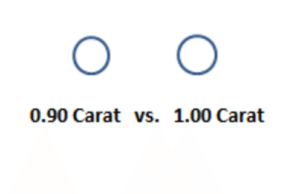 It's deemed as big because sometimes, hearing how many carats a diamond ring has is different from actually seeing how big it is. And when seen in person, that’s what gives it a wow factor! So, if you’re on the market to find a knockout, 3 carats is the way to go! 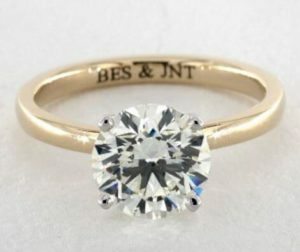 The number is swoon-worthy and will look humongous over a typical diamond ring. 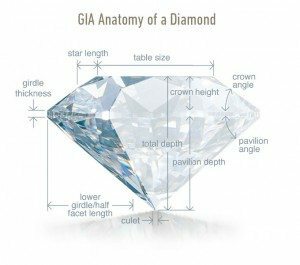 Now that we’re at it, how big is the average diamond size anyway? Let’s talk about that! The Average Diamond Ring Size in the U.S.
You’ve heard this before, and some of you may have asked it yourself. It’s the classic question of how many carats! That’s usually the first thing asked upon seeing a diamond ring. And when the wearer answers 1 carat or more, the receivers are astounded! 1 carat is a popular carat weight and it costs way more than a 0.9 carat. Maybe that’s why 0.9 carat is the average engagement ring size because it’s almost as big as 1 carat, but it costs much less. Although carat is measured by weight, the diameter or the surface of the diamond is what sticks to the mind. And obviously, the 3 carat diamond ring in this picture is the true champ. 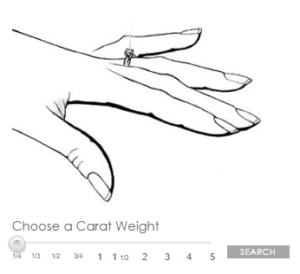 Check out this Carat Size Simulator to see how the different carats will look when worn! Going further, if you’re not into the average and craves for the extraordinary, we’ll have to see if your budget will match the 3 carat diamond price range! How Much is a 3 Carat Diamond Ring? I had a look around at James Allen's collection because currently, they are one of the best places to shop for diamonds since they provide HD 360° videos. At $16,650, the one on the left is the cheapest 3 carat diamond in James Allen’s collection. And to the right is the most expensive at $195, 850. The price difference is huge right?! You might ask why the priciest one looks like a dirty, unsolved Rubik’s Cube. Well, there’s a couple of factors that determine the quality of a diamond such as cut, color, and symmetry. And if you know where to look, you’ll definitely find one that’s within your budget and still be nothing short of amazing. I cannot stress this enough; cut blankets every other criterion for gauging quality diamonds. Most people initially look at the clarity or color to assess the gem’s overall sparkle, but it’s the cut that defines the brilliance. And with great fire and scintillation, it will look bigger than it is! Also, cut is different from shape. 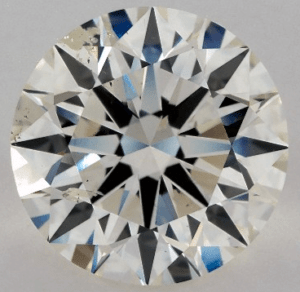 Some use the term “diamond cut” when talking about the shape of the gem, but what they actually mean is the form such as round, princess, pear, and so on. When we say cut, it labels how good the diamond was crafted from the rough. So, even if two 3 carat diamonds have the same size, the one with the better crown angle and pavilion angle measurement will be much more expensive because it will produce much more brilliance, fire and scintillation. 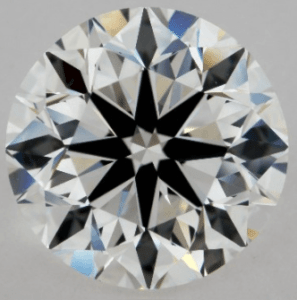 Pro Tip: Always select a diamond with an Excellent (GIA) or Ideal (AGS) cut grade! 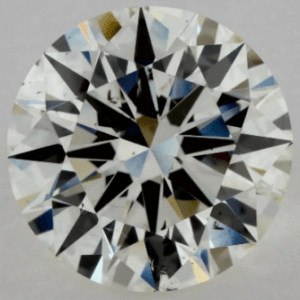 No two diamonds are alike and most of them have clarity characteristics. As a matter of fact, only 1% of diamonds in the whole world are considered flawless. The cleaner a diamond looks, the higher its price gets! Since you’re in a hunt for a big diamond, you should know that 3 carats is more prone to inclusions due to its size. And you wouldn’t want an engagement ring with black flaws that will probably distract your fiancé from appreciating the sparkle. To prevent this from happening, opt for eye clean stones in the VS2 or higher grades. When we say eye clean, it means that there are no inclusions visible to the naked eye. If it’s evident now, look at how crystal clear the inclusions will appear when you click the images and watch them from 20x magnification! 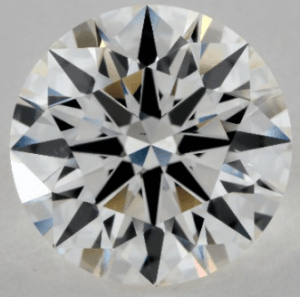 James Allen is currently the only shop that has lets their customers see diamonds in HD videos. I mean, even brick and mortar stores don’t have this radical tool. Pro Tip: Consider diamonds with white or hazy inclusions as they can pass as eye clean because they’re not as striking as black flaws. Plus, they won’t be noticeable under bare eyes! We’re talking about thousands of dollars here, so scammers will try to be as creative as possible just to rip you off! 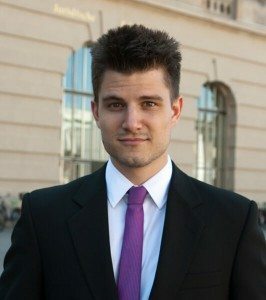 I’ve seen suspicious grading reports, even fake ones that seem authentic. 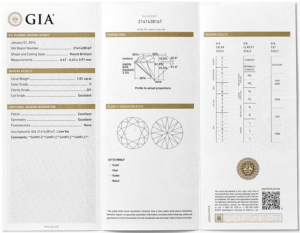 So, the rule of thumb is to have a thorough look at diamond certificates that may appear doubtful, never buy uncertified diamonds, and only trust reliable sources like GIA and AGS – the two most respected gemological labs in the world. Pro Tip: Avoid shops with in-house certifications or labs like EGL that inflate grades, so they can give the impression that you’re saving more money. But in reality, you’re just getting a lower-quality gem! The “dark horse” is an unpopular contender that unexpectedly surpasses expectations. And like the color criterion in a diamond’s 4Cs, it’s not the biggest player in the field. In fact, you should watch out for it because big diamonds, like 3 carats, tend to adapt body color. Meaning, the bigger the gem, the heavier the color that shines through. So, by opting for a higher color grade to prevent the bits of yellow, the price also goes up! On the other hand, what makes body color a surprising winner is it can actually be paired with tinted settings that can wash out its darker tone. Thus, you don’t really have to go for expensive colorless 3 carats. Instead, you may match your lower-graded diamond with a yellow or rose gold setting, and the gem wouldn’t look as dim as it is! The diamond on the left bears the lowest color grade in James Allen which is K.
But don’t be put off right away, because on its right is also a K colored diamond that’s set on a yellow gold ring. Click the image then tap the 2.14 Carat version to see how the K colored gem blended with the colored setting! Basing from the two pictures, I bet you wouldn’t have guessed that they’re the same color. That’s the upper-hand in choosing a yellow gold setting; you may go lower with color and it will still look amazing. With the boost from the other Cs of course! 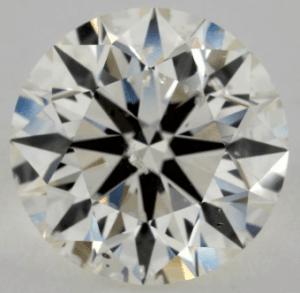 However, if you’d still prefer colorless diamonds, then do not go below the H color to make sure there wouldn't be any touches of yellow or brown. Although there are eye clean 3 carat SI1 and SI2 diamonds, it’s best to opt for VS2 or higher. 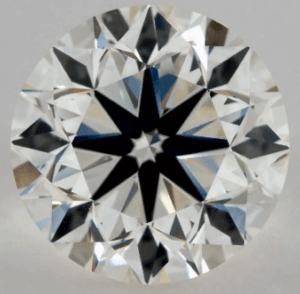 With all that being said, a diamond with a great cut can absolutely surpass a diamond with better clarity and color. So, if you really want to find the right 3 carat engagement ring, then dig deeper! For 65 grand, the diamond on the left is even better than the most expensive 3 carats in James Allen’s collection. And at less than half the price, the one with the K color will go smoothly with a yellow gold setting. This is a testament that if you put in time and effort, you'll discover the biggest bang for your buck! So, best of luck to your search! With all these tips, you may now explore the world of 3 carats. Remember the 3Cs and compromise between color and clarity, but never with cut! Given exquisite dimensions and an eye clean façade, backed by a legit source, 3 carats may just be the magic number to that 3-letter word we all want to hear!